While delivering many benefits, the current plastics economy has drawbacks that are becoming more apparent by the day. Today nearly everyone, everywhere, every day, comes into contact with plastics. Plastics have become the ubiquitous workhorse material of the modern economy – combining unrivalled functional properties with low cost. And yet, while delivering many benefits, the current plastics economy has drawbacks that are becoming more apparent by the day. Significant economic value is lost after each use, along with wide ranging negative impacts to natural systems. How can we turn the challenges of our current plastics economy into a global opportunity for innovation and value capture, resulting in stronger economies and better environmental outcomes? As part of Project MainStream, the World Economic Forum and Ellen MacArthur Foundation, with McKinsey & Company as a knowledge partner, have come together under the guidance of a Steering Board with nine global CEOs, to answer this question. Our latest report The New Plastics Economy: Rethinking the future of plastics lays out a blueprint for an economy where plastic never becomes waste. What’s the state of plastics today? · Significant value is lost: Most plastic packaging is used only once; 95% of the value of plastic packaging material, worth $80-120 billion annually, is lost to the economy. 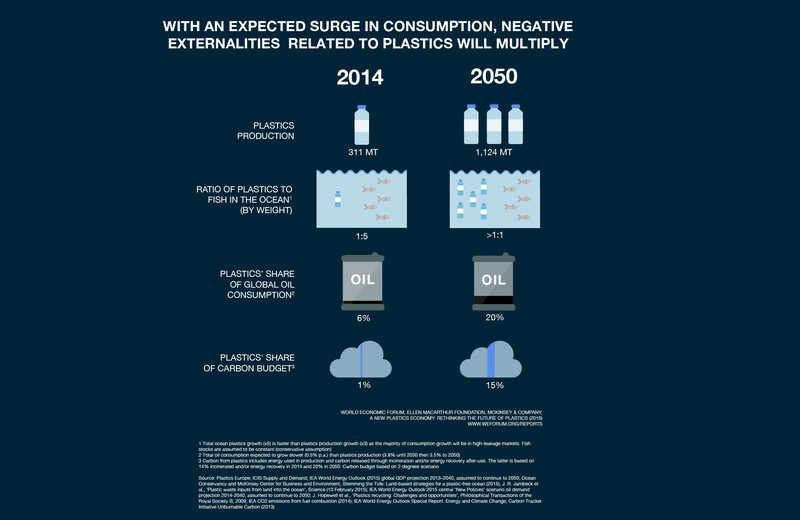 · Substantial negative economic costs: The cost of negative externalities from plastic packaging (e.g. on oceans and urban infrastructure), combined with the cost associated with greenhouse gas emissions from its production is conservatively estimated at $40 billion annually – exceeding the plastic packaging industry’s profit pool. · Under business-as-usual conditions, these negative costs are expected to increase significantly over the coming decades. Given the projected growth in consumption, by 2050 oceans are expected to contain more plastics than fish (by weight), and the entire plastics industry will consume 20% of total oil production and 15% of the annual carbon budget. 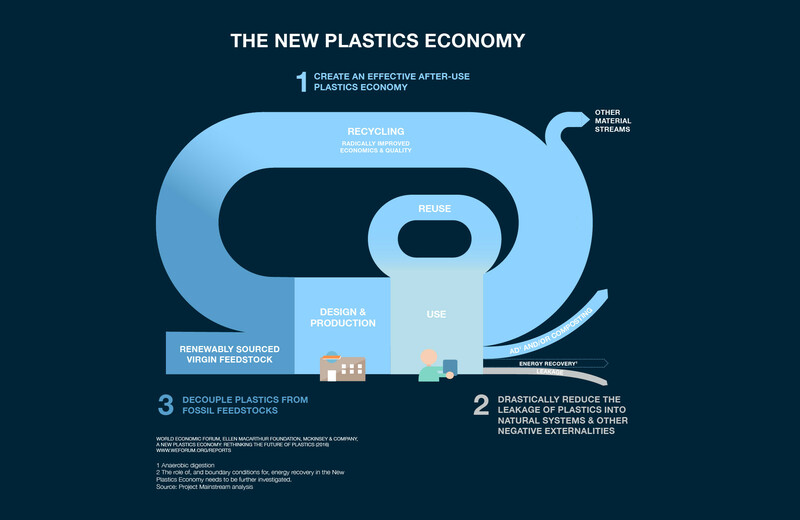 What does a New Plastics Economy look like? 1. Create an effective “after-use” plastics economy – improving the economics and uptake of recycling, scaling up the adoption of reusable packaging, and adopting compostable packaging for targeted applications, helping to capture lost value. 1. Collaboration: Establishing a Global Plastics Protocol and coordinating large-scale pilots and demonstration projects, engaging all stakeholders across the value chain including policy-makers and businesses. 2. Innovation: Mobilizing large-scale, targeted “moon shot” innovations and continuing to develop and encourage scientific research in the area, such as the search for ‘super-polymers’ that combine functionality with superior recyclability, as well as bio-benign materials. 3. Communication: Coordinating and driving communication on the nature of today’s system, the vision of the New Plastics Economy, best practices, and insights. While current innovations and efforts to improve the plastics economy show potential, to date these have proved to be too fragmented and uncoordinated to have impact at scale. These efforts need to be complemented and guided by a concerted, global collaboration initiative that matches the scale of the challenge and the opportunity. The Ellen MacArthur Foundation will establish such an initiative to act as a global dialogue mechanism and drive the shift towards the New Plastics Economy. Those involved in the plastic packaging chain have proven time and again their capacity to innovate. 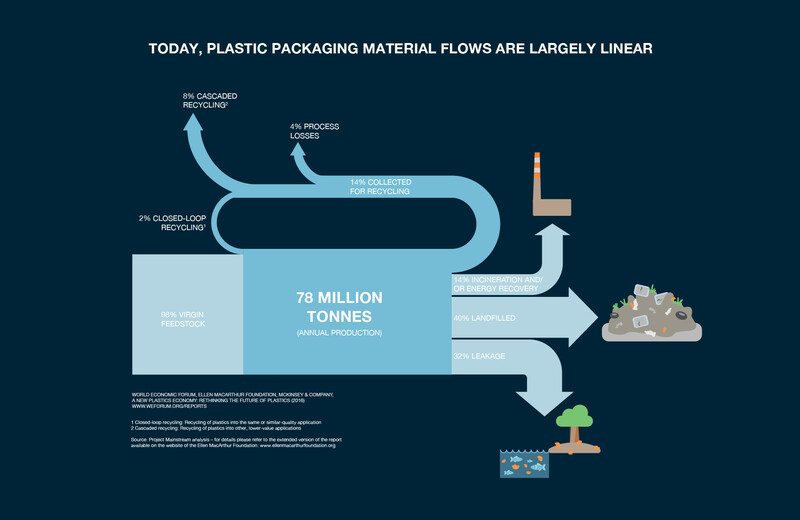 Now, harnessing this capability to improve the circularity of plastic packaging – while continuing to expand its functionality and reduce its cost – could help us move towards a system that works: a New Plastics Economy. The full report, The New Plastics Economy: Rethinking the future of plastics, can be found here. This report has been launched at the World Economic Forum’s Annual Meeting in Davos.